The insurance industry’s top performers across West Yorkshire have been presented with prizes for their strong performance in the Chartered Institute of Insurance’s (CII) qualifications. 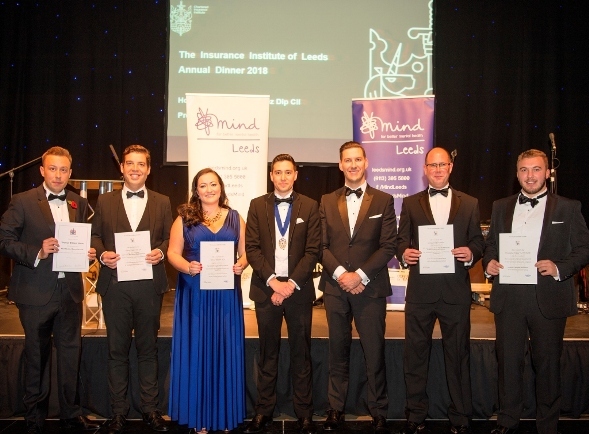 Their achievements were recognised at the Insurance Institute of Leeds’ (IIL) annual dinner attended by over 400 guests which also raised almost £3,500 for charity. The worthy recipients of honours were Tom Storer from Jelf who received The Paul Maynard Memorial Prize national prize for achieving the best result in the country for the Advanced Insurance Broking Exam. Christopher Walker from Bluefin Sport clinched The Certificate in Insurance Prize with Martin Weaver from Lockyers receiving The Trevor Williamson Memorial Prize. Christopher Binns from Model Wealth Management was awarded The Advanced Diploma in Financial Planning Prize with Natalie Bate from Zurich carrying off The Bartlett Sugden Memorial Prize. IIL president James Ramirez said: “Leeds boasts a thriving and buoyant insurance sector and the CII qualifications are market-leading study programmes acknowledged by professionals and organisations worldwide. A raffle and silent auction raised almost £3,500. The fundraising will help to support Leeds Mind – which helps people to overcome obstacles and have more control of their lives – and whose services include counselling, group therapy and employment support. It will also assist The Insurance Charities, which gives over £1.2 million of help to insurance people in need each year. New initiatives launched by President James Ramirez over the past seven months include an Emerging Insurance Professionals group to meet the needs of young, emerging professionals in the area. A Fast Track Diploma Programme helping members to achieve their Diploma with the CII within two years and delivering workshops, training, mentoring and support has also taken off. Established in 1888, the IIL and is one of the oldest professional associations in the country. It continues to provide its original purpose of supporting members through education to promote professionalism within the insurance industry, as well as a rolling calendar of networking and social events.